1.Bring a large pot of water to a boil. Add spaghetti and cook 2 minutes less than package directions. 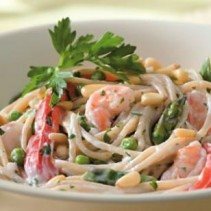 Add shrimp, asparagus, bell pepper and peas and cook until the pasta is tender and the shrimp are cooked, 2 to 4 minutes more. Drain well. 2.Mash garlic and salt in a large bowl until a paste forms. Whisk in yogurt, parsley, lemon juice, oil and pepper. Add the pasta mixture and toss to coat. Serve sprinkled with pine nuts (if using).